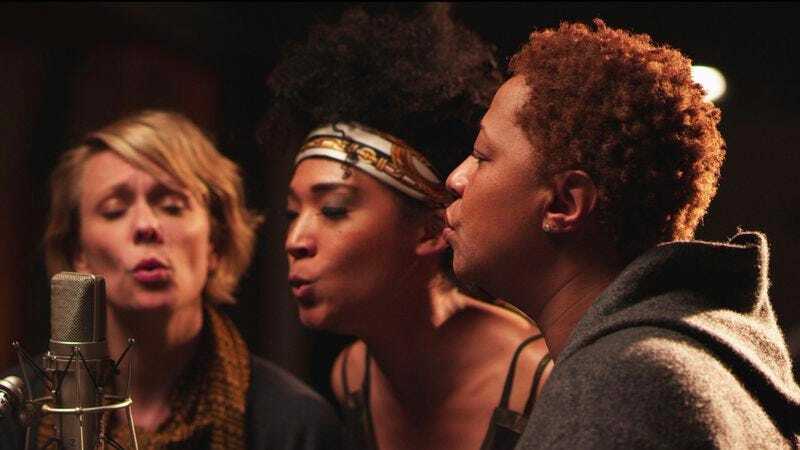 The names of the subjects in Morgan Neville’s documentary, Twenty Feet From Stardom, may not be familiar, and their faces may not ring a bell, but when Darlene Love takes up “He’s A Rebel” or Merry Clayton re-creates the chilling wails of “Gimme Shelter,” they’re instantly familiar. The plight of backing singers is to stand just outside the spotlight, sometimes by choice, but often because they lack a star’s ruthless drive or because the chips never fell their way. Twenty Feet has its stories of heartbreak, of women—and they’re almost all women—whose bids for the limelight were thwarted by the men in power—and they’re almost all men. Love’s is perhaps the most heartbreaking: While under contract to Phil Spector in the 1960s, she cut hit single after hit single only to see them climb the charts with others’ names on the label; she remembers watching the Crystals lip-synch “He’s Sure The Boy I Love” on TV, moving their lips to the unmistakable trumpet-like blast of her voice. After finally getting out from under Spector’s yoke, she signed with a new label, only to have her contract sold back to Spector before she released a single song. At a low point, she was cleaning houses for a living, listening to her songs waft down the hallway as she vacuumed. Others got their shot but missed the target, for the ineffable reasons that talented and charismatic artists often do: The timing was wrong, the right palms weren’t greased, their album cover had been green instead of blue. Clayton is hardly a shrinking violet, but the albums she released under her own name never took off. Lisa Fischer, whose prodigious talents encompass jazz, soul, and rock, won a Grammy but dallied too long on her follow-up album. Judith Hill—filmed after she did the songs for Spike Lee’s Red Hook Summer but before her stint on The Voice—can’t say no to hitting the road with Stevie Wonder, even though he warns her to get out of his shadow. Neville doesn’t dwell unduly on the vicissitudes of fame; he’s more concerned with celebrating his subjects’ accomplishments and giving them a(nother) chance through new recordings on which they sing both backup and lead. Twenty Feet From Stardom touches on fascinating issues, but too often it does no more than that: That the backup singers profiled are largely black and their employers largely white goes mostly unmentioned, apart from Clayton recounting her struggle to decide whether to sing on Lynyrd Skynyrd’s “Sweet Home Alabama.” (She raises a fascinating notion that the gospel vocals, steeped in the black church, work against the song’s redneck pride, but the film doesn’t follow up, apart from a satisfying clip of her singing Neil Young’s “Southern Man.”) Neville struggles to weave his disparate stories, engaging though they are, into a cohesive overall structure. The singers’ voices are heard, but sometimes instead of blending in harmony, they clash with one another.